There is a story to 20XX, but at the moment it’s not really detailed yet. All you need to know is that robots have gone amuck and it’s up to you to save the day. From the start, you can play as two characters: Nina and Ace, or X and Zero for Mega Man fans. As with the Mega Man games, you’ll go through levels to fight robot masters to gain their powers and hopefully stop the bad guy, but its how 20XX is built that makes it so special. Unlike traditional 2D platformers, 20XX is built around procedurally generated levels based on different themes. The boss fights in the game are set encounters with unique enemies, but the way to each fight is different each time. Going through repeated environments, the game will mix up the enemies, platform layout and will make it easier or harder depending on how late in the game you are playing it. 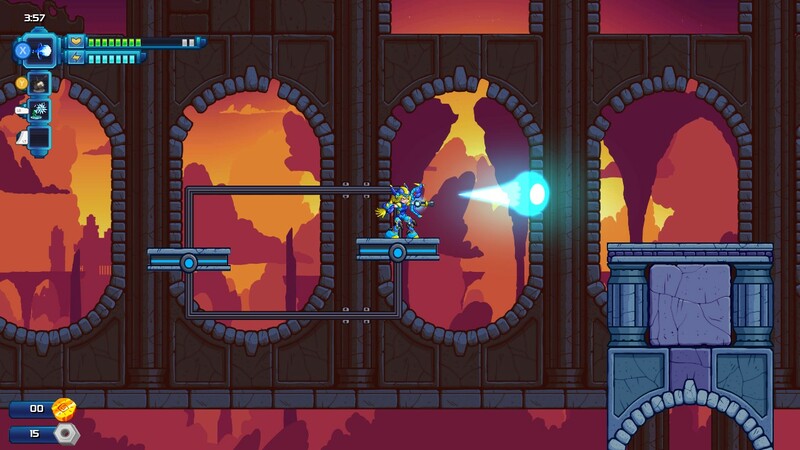 As with the Megaman games, you’ll gain new powers as you play, but 20XX’s rogue-like design keeps things varied. Just like The Binding of Isaac, you’ll find and unlock new passive items as you play the game. These items will alter your base abilities and are found in hard to reach areas, in-game shops, or after a boss fight. While the game’s levels are designed around your basic skill set and abilities, it’s great to be able to essentially “cheat” with jump and dash upgrades to make levels a lot easier. You only have one life during a run, but pits and spikes are not lethal (unless you turn on the difficulty modifier.) After you die, you can spend soul chips to permanently unlocked new items for the next run and beyond. Throw in daily, weekly and extra challenges, and 20XX has a lot to offer platformer/rogue-like fans. While the game is still far from being finished, the core gameplay is definitely set here. At this moment, there isn’t much for me to complain about design-wise, but I’m curious to see how replayability will be improved through to the game’s eventual launch. 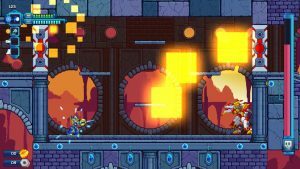 20XX has a lot to like for fans of Mega Man and rogue-like design, and it’s one of those games where my main problem is that I want more. The levels don’t really have enough permutations to make them different on repeated plays. You’ll find similar traps and challenges for each environment and things start to repeat quite quickly. Speaking of level design, the game doesn’t quite hit the same measure of greatness that many 2D platformers before it did, but there is a reason for that. 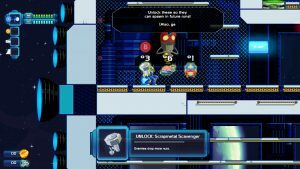 Since 20XX features procedurally generated levels, it doesn’t have the handcrafted feel that we saw in Shovel Knight or the original Mega Man games. The bosses are very varied, but there are a limited number of them at the moment. Considering that the game is a rogue-like, I’m curious if they are going to have random modifiers for the bosses. 20XX reminds me a lot of Spelunky and how it combined both player skill and rogue-like randomness to produce a great game. Even though the game isn’t done yet for me to review fully, this is a treat for action fans and is another example of the advantages that rogue-like design can bring to a game, skill-based or not. For more on 20XX, you can watch my video spotlight of it on the YouTube Channel. If you enjoyed the post, please check out the Game-Wisdom Patreon campaign. Your donations can help keep the site going and allow me to grow with new content. 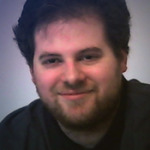 You can also find me on Twitter @GWBycer.